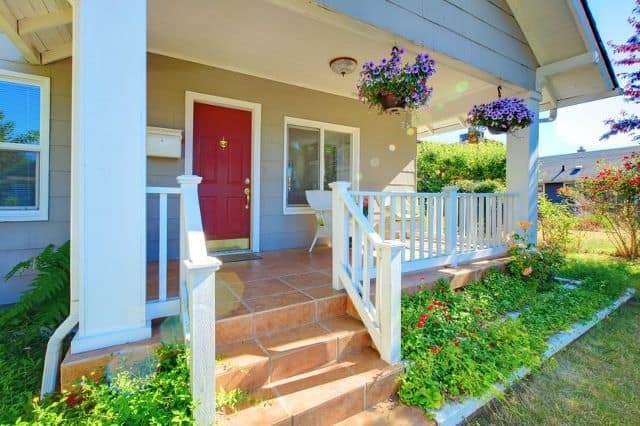 Not only is your front porch a part of your home, it has the added beauty and freshness of the outdoors as well as being a welcoming focal point to your home. A front porch can bring memories of country days gone by at parents, grandparents and friends' homes. I am going to share some fun, fresh, and cool front porch makeover ideas and ways to decorate and freshen up this area of your home. 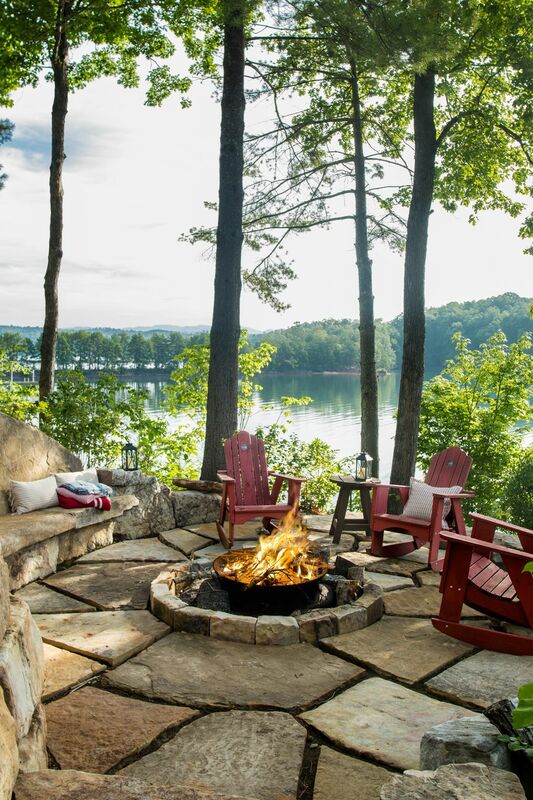 A fire pit can give a natural look to your porch, as well as serve as a place of enjoyment for friends and family to gather. Consider different styles that are available on the market to match the overall look desired for your porch. Keep your fire pit far enough away from the front door, so that you can easily walk into your house without getting burned or getting smoke in your eyes. Also, make sure all wooden furniture is placed far enough away from the fire pit so that stray sparks will not catch furniture on fire. There are so many different options for seating and dining on your front porch. One idea is to have a table surrounded by chairs so that guests can sit down and have a meal together outside. Another idea is that you could have chairs placed in small groupings around your porch or you may want to have a couch and chairs, with a small coffee table in the center. Whatever style and design suits you best, it is important to get furniture that goes with your house color and design. You may want to consider the following furniture decorating styles. Adirondack chairs can help brighten up your porch. 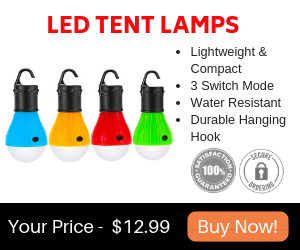 There are many different colors to choose from. If your porch has wood accents, then you may want to use wooden Adirondack chairs. 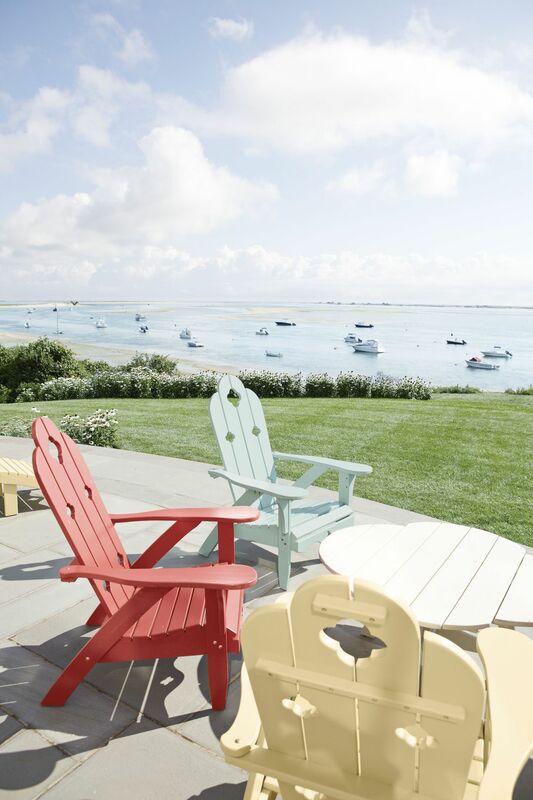 If your porch is colorful, a painted Adirondack chair may go well with your porch. On the other hand, colorful Adirondack chairs can help add color to a plain colored porch. Adirondack chairs can go well with porches that are near a beach or pool, but you can use these chairs no matter where you live. During the cool evenings of summer, it can be relaxing to sit down on beautiful wicker chairs and enjoy the fresh air. To make wicker chairs comfortable to sit on, you can add some pillows or cushions. 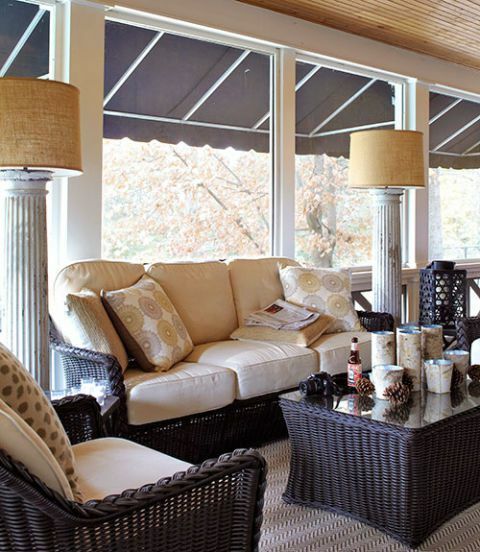 To complete your wicker set, you may want to add a wicker coffee table to your porch. 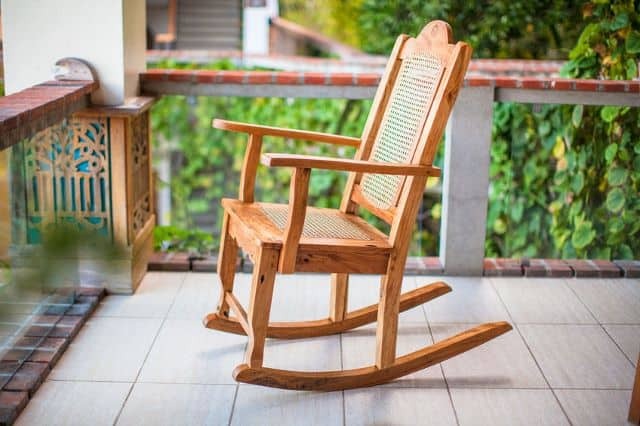 Rocking chairs can look great on a country-style porch. It can also be relaxing to rock back and forth in the chair. Rocking chairs can come unstained or stained so that you have the option to stain/paint it any color you want. 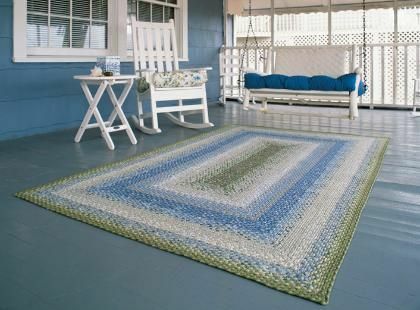 Rugs can add color, warmth, and texture to your front porch. Rugs may be placed under furniture or as also a practical way for people to wipe off their shoes before entering the house at the front door. Rugs should be appropriate to the size and style of your space. You can buy rugs from Amazon and other online stores, or at your local stores. Or, if you enjoy crafts, you can learn how to make your own. You can either make a square rug or a circular rug. To find out how to make a simple circular rug, click here. 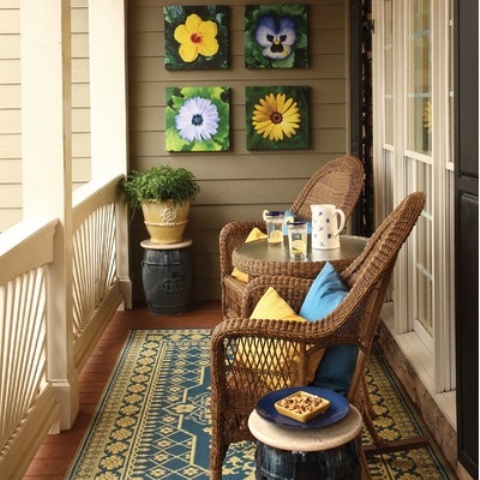 Flowers can add beauty and freshness to the design of your porch. If you have a shady porch, you will want plants and flowers that grow well in shade. Plants well-suited to shade are ferns, culinary herbs, and violas. Geraniums look nice on a porch and are easy to grow. Sunflowers are another easy-to-grow plant that can make your porch look like summer. Other plants that do well on porches include fuchsia and tuberous begonias. Flowers can be hung in pots, planted in pots or planters, or used in garlands or wreaths to accent your porch design. Turn your porch into a dining area by placing chairs around a table. This front porch design can allow friends and family to gather around for a meal. You can decide what chairs and tables will work best for you. There are many different seating options. 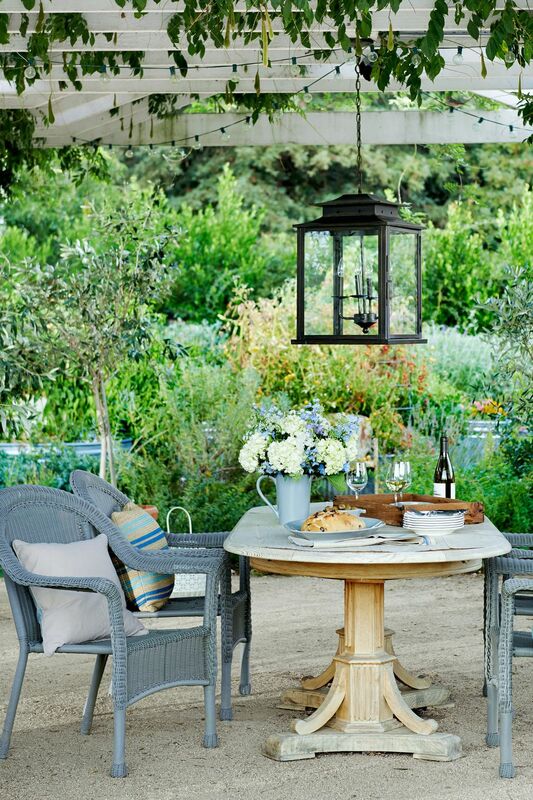 You may want to have wicker chairs, along with a wicker table. Or perhaps a wooden table set would fit your porch style. Make sure to mix and match colors in a way that everything blends to work with furniture, rugs, and flowers. 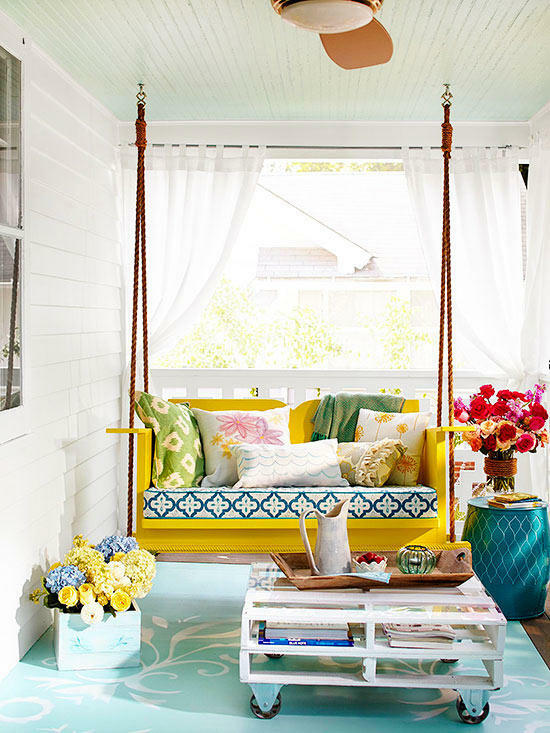 A porch swing is another great seating idea. 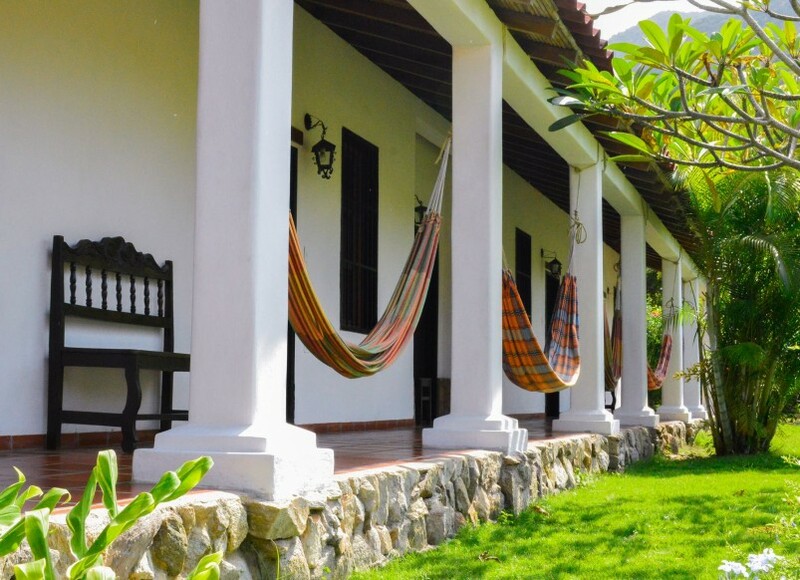 Most porch swings hold two people, but some can comfortably hold several adults. Usually, 4-foot swings will hold two adults, and 8-foot swings will hold several adults. 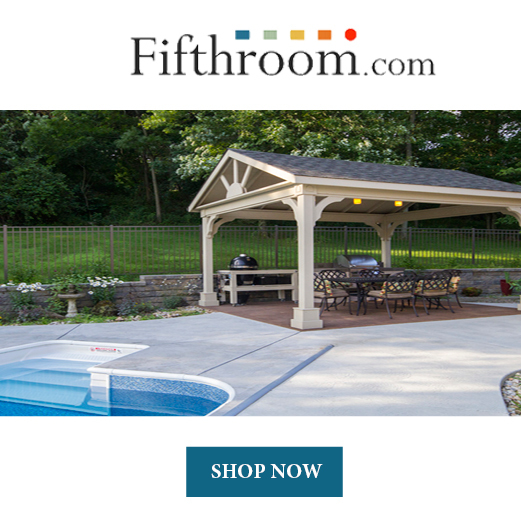 Think of your lifestyle and design preferences when choosing a porch swing. Be mindful that you may want to keep some other seating options available. 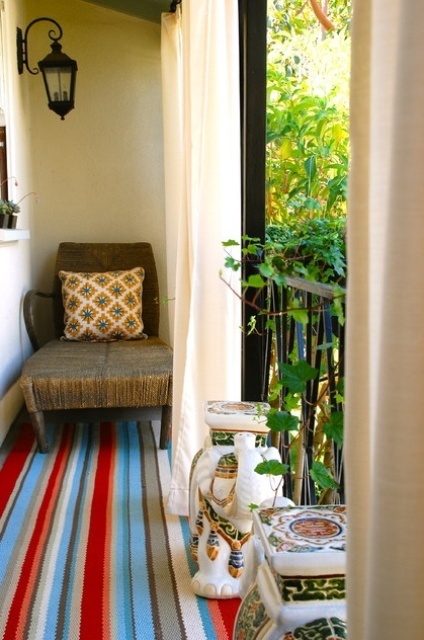 A curtain can provide shade to your porch, as well as privacy. You can choose a curtain that blends in with your porch design. Use colors and textures that will enhance your outdoor area. If you have a roof over your porch, you may want to hang some canvas prints on the wall. This will add creativity and beauty to your wall decor. Remember to put the canvas prints well under the roof, so that rain and other weather does not ruin them. The materials that you will need will depend on what you decide to add to your porch. Think of furniture needs, plants, rugs, paints, or other items you want to decorate your front porch. Make a list and start shopping or gathering materials. Keep your porch simple and free of clutter. Any furniture that is worn out or not used often should be removed from your porch. Too much clutter can distract people from the beauty of your porch. When you clean, remove furniture that is on the porch. Make sure to sweep your porch often, since leaves and dirt blow onto your porch. If your house is white, then consider using darker colored chairs with white pillows or contrasting rugs and artwork. Try to mix and match colors in a way so that everything isn't the same color, but in a way that everything ties in together. Flowers can add beautiful color. The possibilities are endless! Unless you have a large porch, you will want to start small. Do not over-crowd your porch area. Start with one chair or just a small dining table and two small chairs. To save on space, you may want to hang your plants instead of placing them in pots to save on room. During the summer months, your porch will be where you spend a lot of time. It is where guests will enjoy relaxing or where your family will spend time together. Make it comfortable. 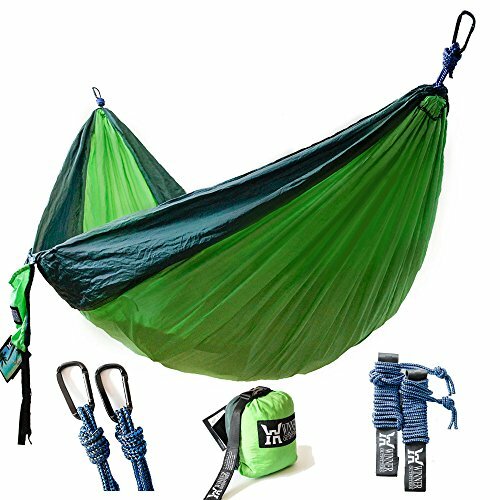 Choose materials that are comfortable to sit on. If the chairs don't come with cushions, add cushions or pillows. Think comfort before purchasing any furniture. Pillows and cushions add not only comfort but can color, texture, and should serve as fun decorating pieces to accentuate your outdoor space. I have listed several front porch ideas to design and accent your front outdoor space, along with tips that can make your front entranceway a place where you will want to entertain guests and relax. There are so many possibilities for a front porch. I hope that these front porch ideas may have sparked more ideas for you. Each front porch structure will be unique and lend itself to ways that make it an inviting place to be. You may want to use one of the ideas that I've gone over in this article, or you may want to combine several of these ideas. Whatever you do, make sure that your front porch is a place that you will want to be. There are no hard and fast rules for designing a front porch. If its something that you like, then you have succeeded in making the front porch of your dreams. Reach for the stars and don't let anything hold you back when you design the living space on your own front porch.